"Brave men don't belong to any one country. I respect bravery wherever I see it." Mural of Juan Escutia by Gabriel Flores (via Rafael Donates). 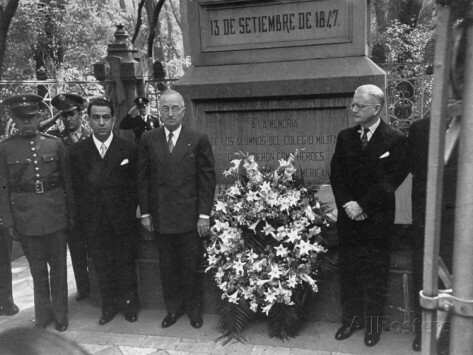 President Harry Truman at the monument to the Boy Heroes at Chapultepec Castle. The Niños Héroes (in English: Boy Heroes), also known as the Heroic Cadets or Boy Soldiers, were six Mexican teenage military cadets. These cadets died defending Mexico at Mexico City's Chapultepec Castle (then serving as the Mexican Army's military academy) from invading U.S. forces in the 13 September 1847 Battle of Chapultepec, during the Mexican–American War. The Niños Héroes are commemorated by a national holiday on September 13. 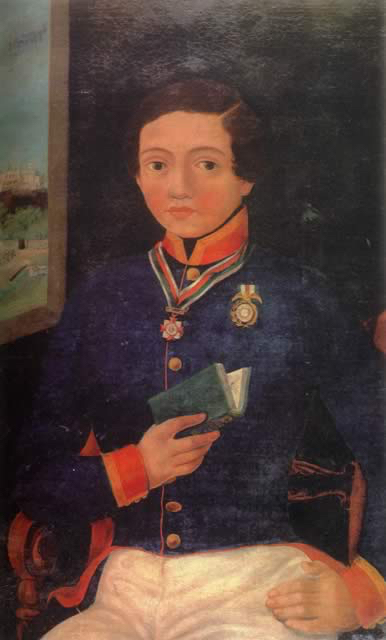 Chapultepec Castle was defended by Mexican troops under the command of Nicolás Bravo, including cadets from the military academy. The number of cadets present has been variously given, from 47 to a few hundred. The greatly outnumbered defenders battled United States General Scott's troops for about two hours before General Bravo ordered retreat, however the six cadets refused to fall back and fought to the death. 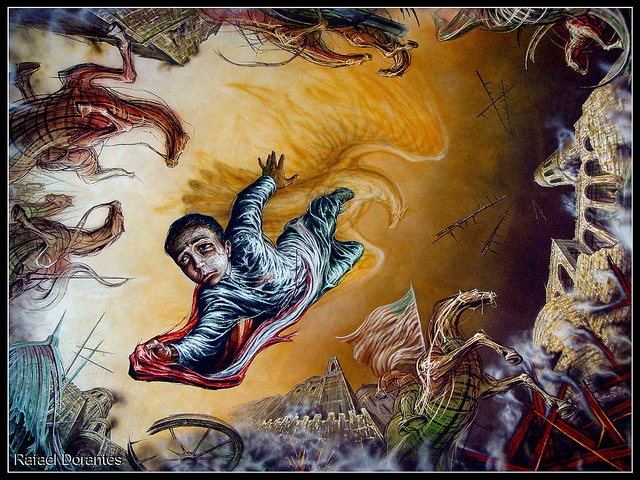 Legend has it that the last of the six, Juan Escutia, leapt from Chapultepec Castle wrapped in the Mexican flag to prevent the flag from being taken by the enemy. According to the later account of an unidentified US officer, "about a hundred" cadets between the ages of 10 and 16 were among the "crowds" of prisoners taken after the Castle's capture. Three of the heroes are pictured below. On March 5, 1947, a few months before the 100th anniversary of the Battle of Chapultepec, U.S. President Harry S. Truman placed a wreath at the monument and stood for a few moments of silent reverence. Asked by American reporters why he had gone to the monument, Truman said, "Brave men don't belong to any one country. I respect bravery wherever I see it." Juan de la Barrera was born in 1828 in Mexico City, the son of Ignacio Mario de la Barrera, an army general, and Juana Inzárruaga. He enlisted at the age of 12 and was admitted to the Academy on 18 November 1843. Francisco Márquez was born in 1834 in Guadalajara, Jalisco. 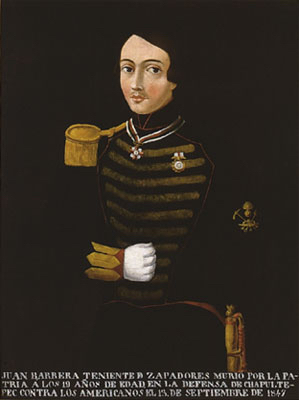 He applied to the Academy on 14 January 1847.A note included in his personnel record says his body was found alongside that of Juan Escutia. At 13 years old, he was the youngest of the six heroes. 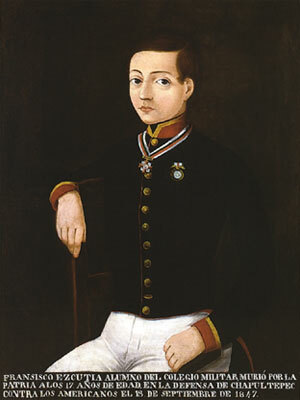 Juan Escutia was born between 1828 and 1832 in Tepic, today's capital of the state of Nayarit. He was admitted to the Academy as a cadet on 8 September 1847. He is believed to have been a second lieutenant; legend has it that he wrapped himself up in the Mexican flag and jumped from the roof to keep it from falling into enemy hands.